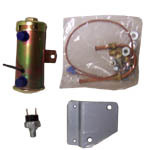 Westerbeke and Universal engine parts can only be shipped withing our Westerbeke sales territory. Please click here for details. When ordering hoses for your Universal or Westerbeke engine it is important to note that the manufacturer has changed the specification on many of its hoses. Some hoses that were formerly sold as formed and fitted hoses are now sold as cut to length hoses. For more information, you may email support. New & Superceded part numbers may not be directly associated to a specific parts book or engine in the results. Please contact us if you need help confirming the part is what you require.